Jamaican sprinter Usain Bolt is gunning to cement his legacy at the Summer Olympics as the greatest sprinter in the history of track and field. He is already the first to win consecutive Olympic gold medals in the 100- and 200-meter races, and he’ll attempt a three-peat in Rio. His quest kicks off Sunday night with the men’s 100-meter final. Gatorade , Hublot and Virgin Media VMED +% quickly snapped up the world’s fastest man to pitch their wares. Gatorade introduced Gatorade Bolt, a new lemon ice-flavored drink. Visa V -0.40% inked him to a deal and used him in ad campaigns extensively in Europe, where track has a much higher profile than in the U.S. Visa is no longer in the fold, but his current endorsement portfolio now includes 10 global partners, ranging in value from $1-4 million annually with Puma being in a class by itself at eight-figures (he also has seven regional partners). Bolt even has his own character in the Temple Run gaming franchise. The game has been downloaded more than one billion times. Bolt has been busy off the track in 2016 leading up to the Rio Olympics. He signed deals at the beginning of the year with Japan’sAll Nippon Airways and Australian telecom company Optus. He inked a deal with Enertor to be the face of the upstart sports insole brand, receiving an equity stake in the business. 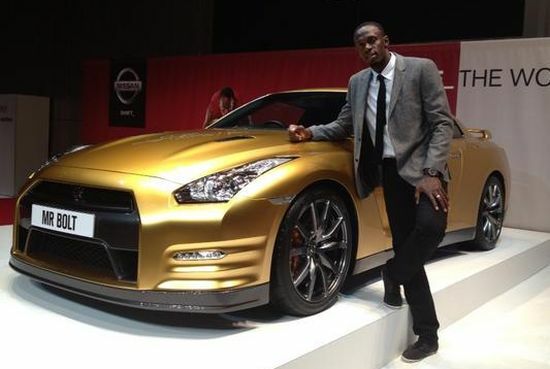 Bolt launched his new shaving company, Champion Shave, a week ahead of the opening ceremonies. Bolt moved passed comparables in track and field long ago. His comparables for endorsement deals are other global icons likeCristiano Ronaldo, LeBron James, Roger Federer and Lionel Messi. He ticks every box for corporate sponsors with a prolonged stay at the top of a global sport and a not a whiff of controversy off the track. A Hollywood director couldn’t create a better name than Usain Bolt for a world-class sprinter, and his “To Di World” pose, copied from a Jamaican tourism ad, is a trademark that follows him from meet to meet. The earnings gap between Bolt and the other top stars in track is unlike anything we’ve seen before in sports. Tiger Woods dominated golf throughout the 2000s, generating boffo TV ratings and higher attendance at tournaments he attended. His annual earnings peaked at $125 million, but even that was less than three times what the No. 2 earner in golf, Phil Mickelson, made. Floyd Mayweather sucked up all of the air in boxing and his biggest earnings year of $300 million in 2015 was twice what his rival Manny Pacquiao made. Michael Jordanmade $78 million in 1997, which was three times Shaquille O’Neal’s take.